Drew Brees is a Golden God. Okay, a Black-and-Golden God. He enters Week 9 of the NFL season with an all-time record of 72,435 passing yards. And his 502 passing touchdowns are just 38 behind all-time leader Peyton Manning. With every completion, he breaks another record. His passing is like nothing seen before—innovative, aggressive, swaggering, rousing and raucous. He drives his fans into an orgasmic ecstasy. But outside of the screaming masses, Brees leaves many others cold, believing his records lack substance and his greatness is vastly overstated. Despite his smashing success, Brees is never lifted above his current and former contemporaries. Tom Brady is The Beatles of quarterbacks. But in the debate of greatness, The Rolling Stones is not Brees but Peyton Manning. Most people are Brady people. There are some Peyton people. Brees is not even referenced in the debate. So if quarterbacks were rock icons, Brees is Led Zeppelin. Brees has distanced himself from Tom Brady in yards and likely will pass both Brady and Manning in touchdowns. It’s similar to how Zeppelin broke records set by The Beatles and were easily the most popular act of the 1970s. They, more than anyone, defined stadium rock. 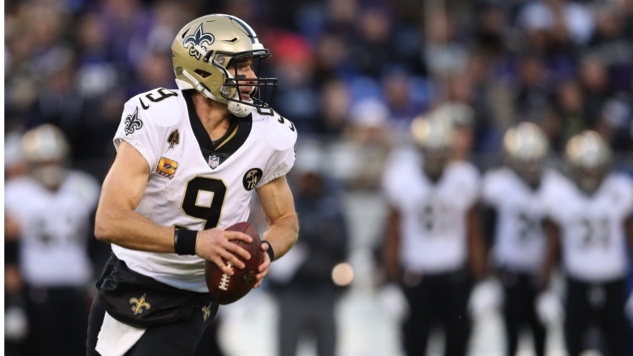 Brees similarly defined modern football and the emergence of the passing game as an unstoppable force, throwing for 5,000 or more yards five times, compared to four for every other quarterback in history combined. And while Zeppelin didn’t win a Grammy during the life of the band, Brees has incredibly never been named the NFL’s Most Valuable Player. Wut? Brees soon beat an Olympic archer in a bullseye contest for cryin’ out loud. Witness. As his career went on, Brees’s records were discounted due to playing indoors, not producing enough wins even after a Super Bowl victory and being the product of modern excess. Instead of being canonized for his accomplishments, he’s was bashed as overpaid and overrated. But the world finally caught up with Zeppelin. And it’s catching up with Brees now. Reviews of Brees are being revised in real time while his career is still in progress. He’s moved from overrated to The Most Underrated Player Ever. Insiders and coaches who once rolled their collective eyes at his statistics now say he’s the perfect quarterback. Even his biggest knock relative to Brady, his won-loss record, is being laid mostly at the feet of his historically inept defenses. But it’s still too soon, apparently, to all the way to saying that Drew Brees not only has been the most productive quarterback in NFL history, but also The Greatest one, too. Check back in about 2040.